The avant-garde European paintings and sculptures at the 69th Regiment Armory inspired responses of all kinds. Cartoonists created witty parodies, critics argued and debated in print, and some expressed their reactions in rhyme (still others, like John Sloan, combined drawing and verse in his satirical “A Slight Attack of Third Dimentia [sic]”). Poems about the new styles appeared in newspapers across the country, and while most were lighthearted, they often touched on the same issues that critics discussed in serious prose. I gain a faint impression. Art is itself embodied in each curve! The sculptor chisels life down to its core. Blessings on you, painter man! Make us see the thing you saw? We shall come to your sensation? Meaning of the thing you’ve made. That is question of your skill. Else it isn’t Art. Lord no! Cyclones of green, and purple rainbow-storms. You go out with a whirlwind in your head. Maurice Morris, “At the International Art Show” (excepts), The Sun (New York), February 23, 1913, 10. 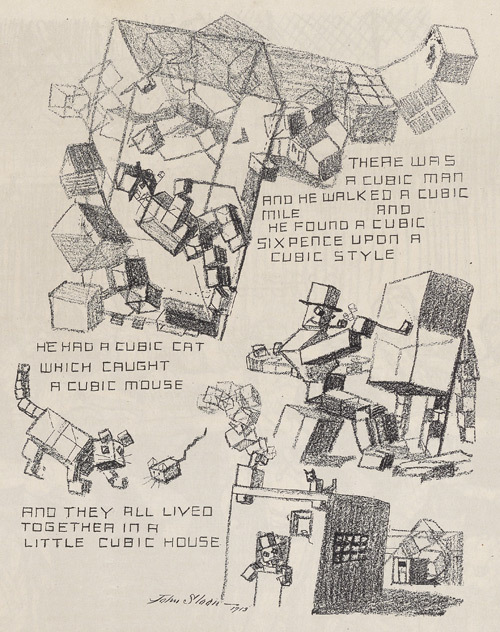 “The Cubist” (excerpt), Chicago Daily Tribune, March 20, 1913, 6. Harry Kemp, “The Exhibition” (excerpt), The Independent 74: 3353 (March 6, 1913): 512.